Took a little break from playing because of the holidays. Can't wait to get going! Picking up where I last left off, I'm making a beeline from the first trial site to the second site. 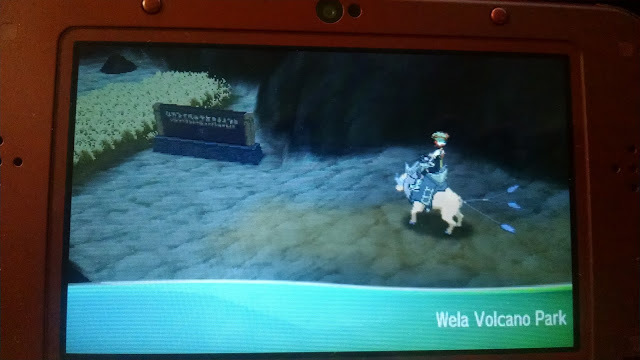 Lana, Captain of Akala's first trial, said the next trial takes place at a volcano and the 2nd Captain specializes in fire-type Pokemon. To give my party variety, I decided to heavily switch out my party. *Right outside the trial area,this is my party as of right now. 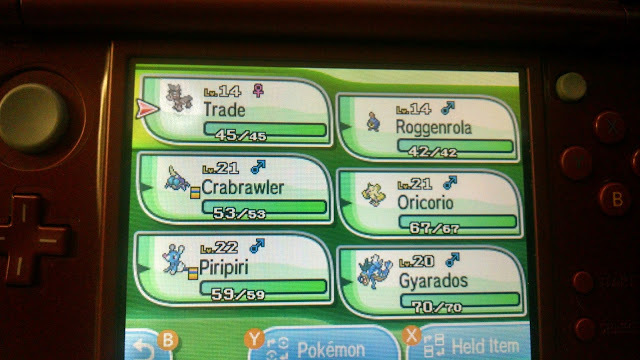 With my starter in hand, I tried to make my party primarily anti fire-type team. I feel a bit guilty using "Trade"/Mudbray because I received it in a wonder trade. I've already caught one passing through or near Paniola Ranch but I'm using "Trade" because it gains an experience boost for being a traded pokemon. Unfortunately, this Mudbray has the "Own Tempo" ability, which prevents confusion, instead of the ability which increases your defense every time you are damaged. Don't recall seeing Roggenrola before so I thought I'd give it a try. I'm too stubborn to look up the type chart but I believe rock-types are strong against fire-types. I snagged a Magikarp before I left Brooklet Hill and promptly evolved it to Gyarados. I still really like Crabrawler and Oricorio so they're remaining in the party for the time being. They also serve to round out my party so I'm not completely helpless against a grass-type or electric-type. 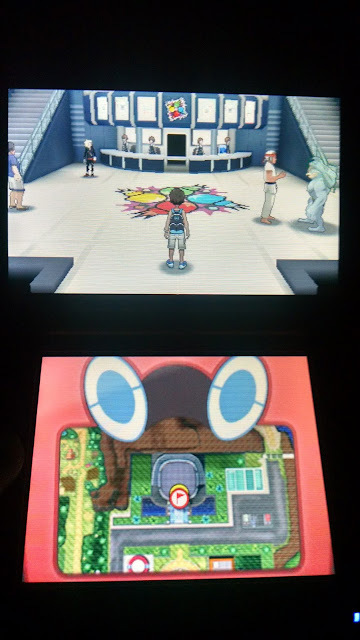 To get to the second trial, I have to go through Route 6. 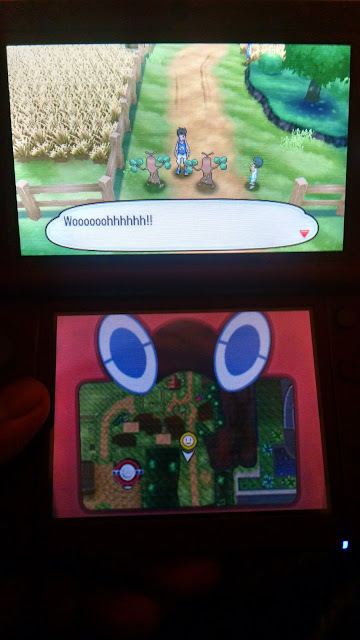 The entrance to Route 6 via Paniola Ranch is currently blocked by a pair of Sudowoodo. Before departing, Lana recommended I try and scare with the Sudowoodo by flashing the Waterium-Z at them. I don't recall if I had to fight these guys or not but I didn't see a Sudowoodo in my Pokebox the last time I checked. I assume I didn't have to otherwise I would have tried to capture it. After doing some exploring,I found out Route 6 connects to the first city of Akala Island, Heahea City , a blocked off section of Paniola Town and a place called "Royal Avenue". 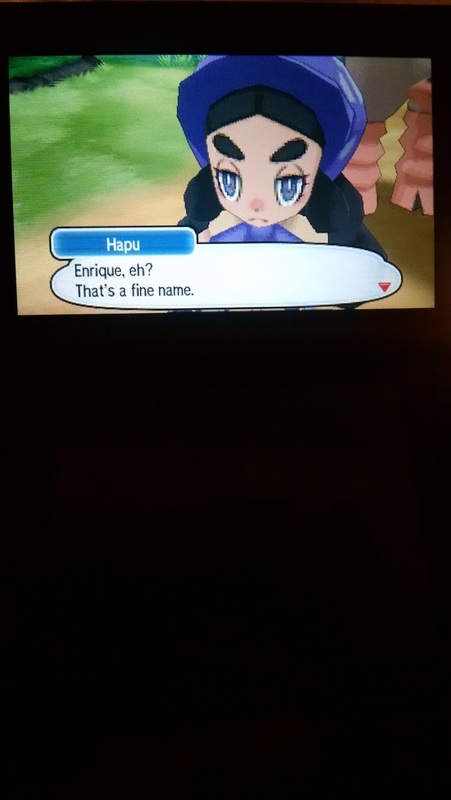 Outside the entrance of Royal Avenue, Team Skull was harassing a girl named Hapu and her horse/pony. I wonder if my Mudbray will evolve into that pony? Anyway, we had to fight the Team Skull Grunts before moving on. *I really,really hope I can wear a wrestler mask on my character. It does!! When you reach the waypoint, the gears will be set in motion for a Battle Royale with your character, "The Royal", Hau and Gladion. You're forced into using the first Pokemon in your party(I was training my Magikarp at the time. RIP.) Battle Royale is a new type of Pokemon battle. 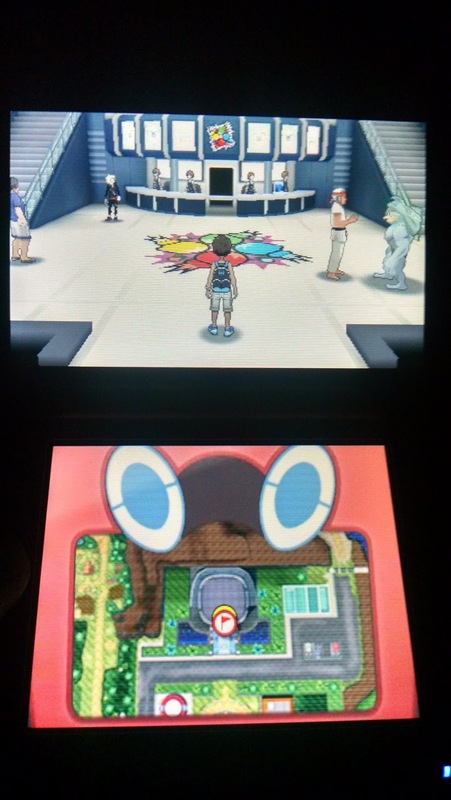 It's a four person free-for-all where you keep fighting until any 1 trainer no longer has any Pokemon left. 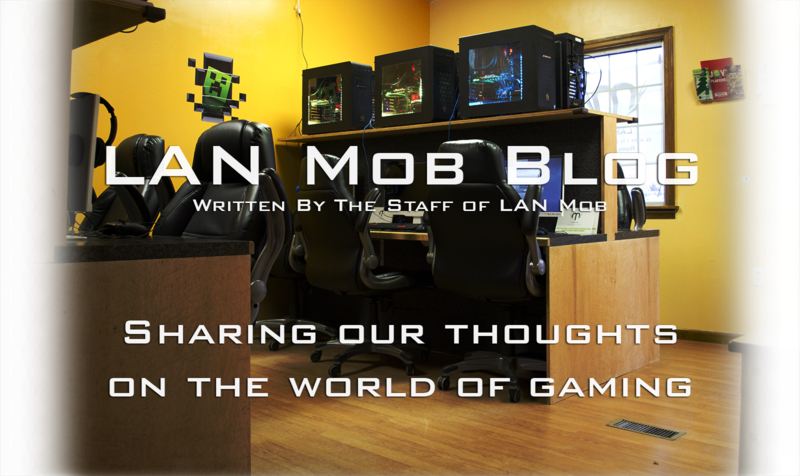 To win,you have to have the highest score out of all the competitors. You score is based off how many Pokemon you've KO'd and any remaining Pokemon you have at the end of the battle. Multi-target moves like earthquake are reduced to half of its base power. Aside from the scripted encounter, win or lose you will earn BP, which is used to buy various goods inside the Battle Royale Dome. I'll have to come back here once I'm more familiar with Pokemon of this region. This place is great! 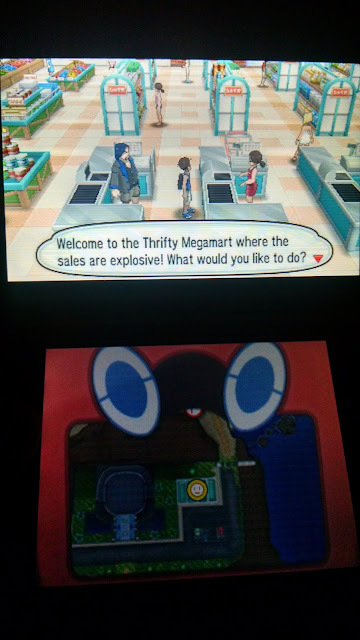 Thrifty Megamart is between the Battle Royale Dome and Route 7. They had a ton of different goods and even gave you a rebate coupon. The coupon gave you back 1/2 your money after every purchase. I stocked up on so many healing items that I forgot I was saving up money to buy a new TM.Ah well. I hope the rebate coupon is a daily occurance. I'll certainly be back when I get more money. *Here we are! At the base of the volcano! That'll be it for this blog entry. I'm hoping to get a good feel of my current party before I take on the second challenge. I'm going to try and take advantage of wild Pokemon calling for help to to train my party. Also, since it is a volcano, I'm hopeful that I'll snag a cool looking fire type. Hopefully I won't be caught in an awful status effect loop!